It masterfully combines superior optic performance, expandability, ergonomic design, and cost performance. 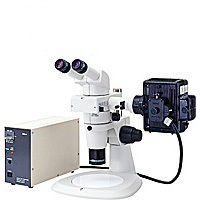 Employs high magnification (0.8 - 8X) and high zoom ratio (10X zoom), allowing observations in a wide range of total magnification from 4X to 480X*. *The Plan Apo 1X objective with high N.A of 0.1 and high resolving power of 300 lines/mm is used. *: Total magnification depends on the combination of eyepiece and objective used. *Employs high magnification (0.8 - 8X) and high zoom ratio (10X zoom), allowing observations in a wide range of total magnification from 4X to 480X*. UThe SMZ1000 masterfully combines superior optic performance, expandability, ergonomic design, and cost performance. * Enables fluorescence observation of living cells with a stereoscopic microscope. * Quick switching between fluorescence and brightfield observation is possible.